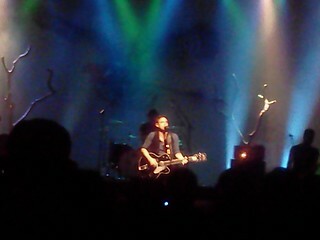 I hadnt seen the Airborne Toxic Event in quite a few years and hadnt remembered their prior sets quite so lively. The band did not disappoint. They put on a really great rock show. Mikel Jollett, lead singer, wasted no time at all before climbing on the stacks on the far left side and singing to the audience all over there. He really worked the stage using every bit of it – making rounds to each side. By the 2nd or 3rd song, he jumped into the audience and started playing from the crowd. The crowd was really into it and were singing along and dancing. There was so much energy from the entire band. The guys moved from different instruments throughout the set which was pretty cool. Mikel was often times on top of the drum kit and playing from there. The other band members each had their turn up there. There were some pretty incredible guitar solos as well as bass solos. Mikel gave each member a shout out and plenty of time to show off how talented they were. The set just flew and before I knew it, they were onto the encore. Some of the highlights during the set were ‘Numb’, which it didn’t seem a lot of people knew or were into. Their cover of the Magnetic Fields ‘Book of Love’, was just beautiful and sounded really incredible and fresh. They ended the night with a raucous encore of a medley of songs that had the crowd going nuts and singing along. It started out with their own song “Missy” which then became Johnny Cash’s ‘Ring of Fire’ and then turned into Tom Petty’s ‘American Girl’ and then they did a quick pause. Mikel talked about the next song being a huge protest song and how most people in this country have no idea what the song is about. Of course, it was Bruce Springstreen’s ‘Born in the USA’. By the time it was done, they had taken it back to ‘Missy’. It was a real incredible way to end a really amazing set. I definitely had missed seeing a balls-out rock show that just rocked! By the end of the night, everyone was a sweaty mess from dancing and singing. It was great fun and a band I will definitely be seeing again. The opener Midnight Air, also from LA, were a harder edged rock band. 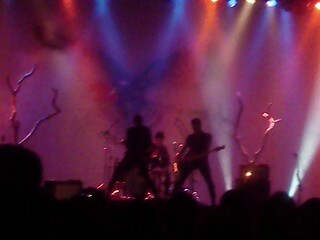 While they were good, I wasnt blown away by them. One of the band members was in Film School which I had really liked but this was definitely not the same band. The band clearly had a great time and were excited to be playing in SF for the first time. They were talkative and friendly and fun! The band was also excited to be playing their last show with ATE and clearly had a great time on tour with them. Im guessing theyre playing Coachella about now. If youre on the fence about seeing the ATE, and theyre heading East – Id definitely say not to miss them. You definitely will have a great time! Does This Mean Youre Moving On? This entry was posted on April 18, 2013 at 10:06 pm	and is filed under Adventures in the Big City, Live Music, Random Ramblings, San Francisco. Tagged: 4/11/13, Airborne Toxic Event, concert, indie, indie-rock, LA, live, Mikel Jollett, music, Nightmare Air, rock, SF, Warfield. You can follow any responses to this entry through the RSS 2.0 feed. You can leave a response, or trackback from your own site.